Primeape in game: 563 Who? Important notice! Pokemon Primeape is a fictional character of humans. 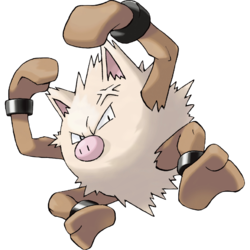 Primeape is a bipedal Pokémon with a round body covered in whitish, shaggy fur. There is usually has a stress mark on the left side of its forehead, and it has triangular ears with pink insides and a pink, snout-like nose. Its arms and legs are brown and have metal shackles on the wrists and ankles. This is probably indicative of a method of training with weights. The hands have no visible fingers, instead resembling mittens or boxing gloves, and the feet have two toes. Primeape is easily angered; even the slightest glance of eye contact will make it furious. When Primeape is furious, its blood circulation is boosted. This makes its muscles stronger, but at the cost of some of its intelligence. It will chase anyone who upsets it and will not stop until it has caught its quarry. Even if it is awoken from sleep, it will groggily chase whatever woke it. Primeape can be found in vibrant forests or on mountains. It has shown some fondness for bananas. In Primeape Goes Bananas, a Mankey steals Ash's hat. 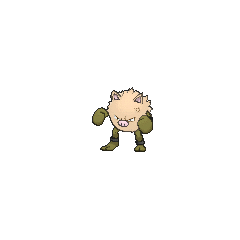 Later in the episode, thanks to Team Rocket, Mankey gets angry and evolves into a Primeape. Ash's Charmander battles the Primeape and Ash catches it. A Primeape led a group of wild gang of Fighting-type Pokémon in Chikorita's Big Upset. It was defeated in battle by Chikorita and immediately surrendered its gang leadership to Chikorita. It then helped fight Team Rocket. Butch of Team Rocket has a Primeape which appeared in The Fortune Hunters. 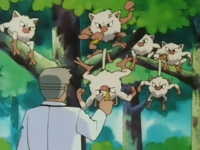 Several Primeape appeared in Journey to the Starting Line!, where they attacked Professor Oak, Delia, Tracey and Gilbert who tried to retrieve a starter Bulbasaur after it got stuck in a tree. A Primeape appeared in Princess vs. Princess competing in the Queen of the Princess Festival contest. A Primeape was seen in a Pokémon Lab in Riddle Me This. Multiple Primeape were among the Pokémon seen at Professor Oak's Laboratory in Showdown at the Po-ké Corral. 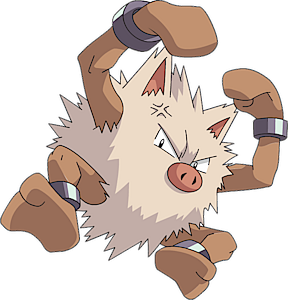 A Primeape was among the Pokémon controlled by Cassidy and Butch in Pikachu Re-Volts. Multiple pink Primeape resided on the Pinkan Island in In the Pink. Primeape also appeared in The Power of One. A Primeape was seen in a dojo in Wired for Battle!. A Primeape was one of the Pokémon seen at the Pokémon Swap Meet in Tricks of the Trade. Two Hits and a Miss featured a Fighting-type dojo where one of the many Pokémon was a Primeape. Wobbu-palooza featured a Primeape belonging to a Festival Crasher. A Primeape appeared in Beauty and the Breeder where it participated in Bonitaville's Pokémon Beauty Contest. A Primeape was one of the Pokémon seen in a forest outside the Ice Path in EP250. A Primeape was seen training alongside its Trainer in You're a Star, Larvitar!. A Primeape appeared in the opening of Destiny Deoxys and Lucario and the Mystery of Mew. In Wartortle Wars A Primeape is first seen as a wild Pokémon that Saur defeated, becoming an Ivysaur afterwards. This catches the attention of the looming con artist, Green, starting a long-winded chain of events that led to Red first losing his money to her charm, and then his Badges. In The Primeape Directive, a herd of Mankey, led by a frustrated Primeape, attacked Yellow and her temporary master, Blue, whose Porygon defeated it. Yellow then empathies the poor Pokémon and has it leave peacefully to the wild. 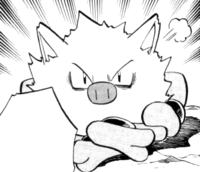 It later appeared along with its herd of Mankey in The Legend after the industrial ruins in the Kanto mainland had been restored by the healing light. In Quilava Quandry, a Primeape was used by the Day-Care Couple to help train Gold. 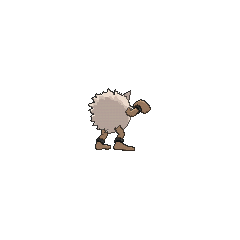 Much later, Chuck, Blue's own master, owns a Primeape, seen in Scrappy Skarmory working out with him and his Poliwrath. Together with Poliwrath, it used DynamicPunch to reveal Suicune's presence in the ocean off the Cianwood coast, but the Gym Leader was defeated in the end, even after being joined by a friend. 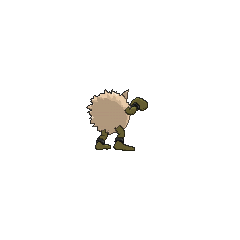 Another Primeape was one of the Pokémon sent to help the fight in Ilex Forest in The Last Battle XIII. Cantonese Chinese 火爆猴 Fóbaauhàuh Literally "Fire bursting monkey"